Mayor Ford and Doug Ford in recent weeks have tried to reduce the number of criticisms leveled at Doug Ford in his bid for Toronto mayor. 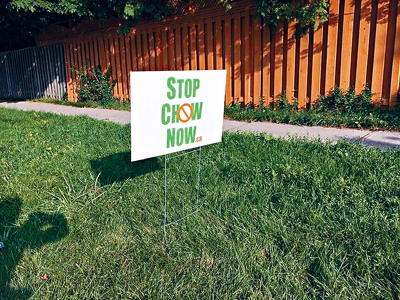 Additionally, an organization has launched a campaign called STOP CHOW NOW which has resulted in a number of lawn signs popping up. According to The Star, Doug Ford has responded to John Tory’s accusations of being evasive about his brother’s troubled time on council. “I love my brother, but Rob Ford is not Doug Ford. I will prove to you I will not evade the issues,” Doug Ford said. Although Doug Ford said he and Rob Ford are not the same, he’s been using the mayor’s former election resources, such as lawn signs, offices, and personnel. Doug Ford spokesman Jeff Silverstein and mother Diane Ford also stated emphatically last week that the two brothers are very different people. Strategist and pollster Dimitri Pantazopoulos believes that Doug Ford’s efforts to distance himself from Rob Ford is not only a pointless election strategy, but it also highlights their lack of strategy. Olivia Chow and Tory have continually argued that both Fords offer the same agenda. According to Global News Toronto, home-owners in North York and across the city have erected STOP CHOW NOW lawn signs, backed by Toronto Taxpayers Coalition. The group believes that Olivia Chow’s higher-tax leftwing ideology must be stopped, and that voters should know what they are in for if they vote for her.